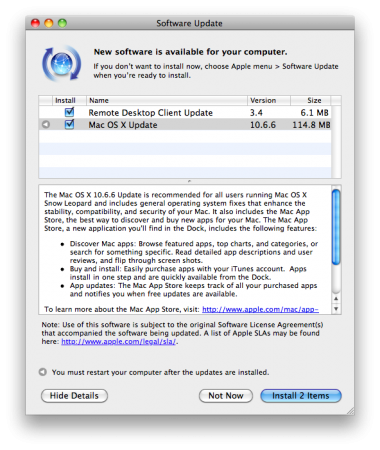 Apple has released Mac OS X 10.6.6 update. The update brings support for Apple’s Mac App Store which is launching today. The store will allow customers to find and install apps the same way they do with iOS apps. The Saudi Arabia Mac App Store is open as well. To learn more about the Mac App Store, visit: http://www.apple.com/mac/app-store. For detailed information on this update, please visit this website: http://support.apple.com/kb/HT4459. To download the update: click the Apple logo in the main menu and choose Software Update.